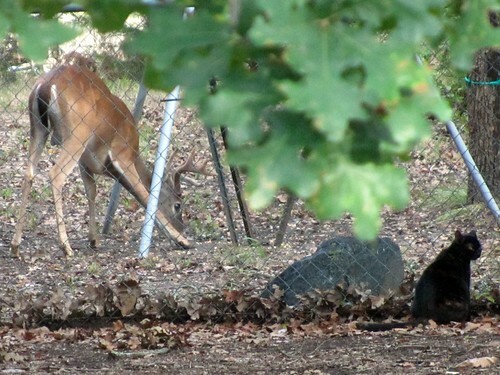 My cat, Bunky was visiting with the deer, Bucky this morning. In fact, she was hanging with two bucks. One is a a 6 point and the other an 8 point. 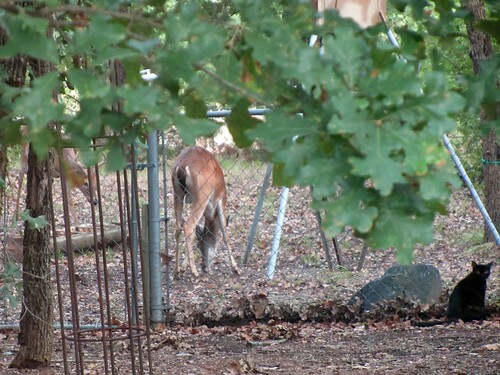 They are in a No Kill Zone on my land, so the only shots taken are with cameras. Bunky looks like she is posing, doesn't she? 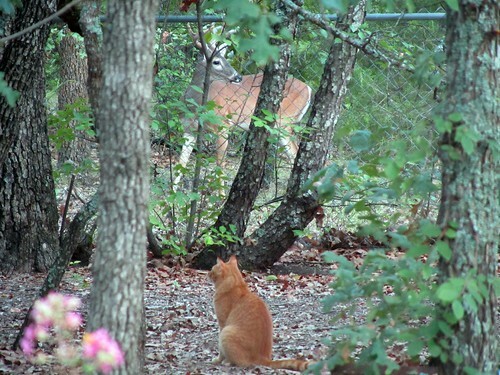 Here's another cat, Chuck, hanging with a Buck. Mornings in Poetry. You just can't beat 'em. Lani, apparently, I am getting good at hitting reject, even when it's not my intention. Here's what she said, y'all! 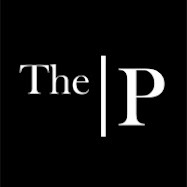 Mindy, love your pictures! We live on acreage, but seldom see deer. I'm such a deer freak, too so it makes me sad :( But I'm also a cat freak. Love seeing your cute kitties, too! Lanette, what is really cool, is that I'm about 40 minutes from Dallas. Who knew nature was so close? Awwww, what a great view to wake up to!! Hope you get to find some good treasure this weekend! Bunky, Bucky, Chuck, Buck...how do you keep 'em all straight? Aww, they are beauties! My kids would be trying to catch them and begging ~ can we keep them!